Sister Ruth Johnson of the Sisters of St. Francis of Tiffin, died at 3:30 p.m. Tuesday, Aug. 1, 2017, at St. Francis Home. She was born Oct. 17, 1923, in Riga, Michigan, to Roy Osgood and Emma (Miller) Johnson. Surviving are a sister, Mary Jo DiValerio, and many nieces and nephews. She was preceded in death by her parents; four sisters, Lois (Johnson) Forgette, Susan (Johnson) Harley, Leona Chavanec, and Marie (Johnson) Dominique; and six brothers, Philip Johnson, Mark Johnson, Lawrence Johnson, Bernard Johnson, Leon Johnson and William Johnson. 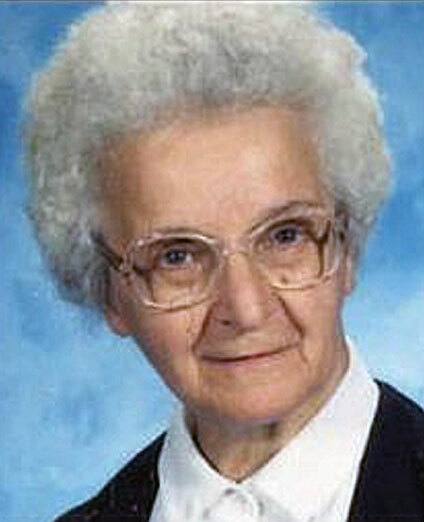 Sister Ruth was the 10th of 12 children. She earned a master of arts degree from Catholic University, Washington, D.C. As a sister of St. Francis, she served as a teacher in the following Ohio schools: St. Mary’s School, Edgerton; St. Bernard’s School, New Washington; Our Lady of Consolation School, Carey; and St. Sebastian School, Bismark. While serving at Miller City-New Cleveland School, New Cleveland, and at Holy Trinity School, Bucyrus, she was both teacher and principal. Later she served the Catholic schools in the Diocese of Toledo as the social studies supervisor. During her years in education, she taught third through eighth grades and was a principal for seven years. Upon completing her teaching career in 1972, she returned to the motherhouse in Tiffin, where she served as the sacristan. In 1975, she returned to what she had loved doing as a volunteer in high school, working with the elderly. She became director of recreational activities at St. Francis Home, a position she held until 1985. In subsequent years, she served as coordinator of the activities program for senior sisters at the motherhouse and as director of the historical museum. In the civic community, she served as president of Seneca County Church Women United and coordinator of Seneca County Migrant Ministry. Until the time of her death, she served as a minister of prayer at St. Francis Home. Visitation will be 4-6 p.m. today, Aug. 3, 2017, at St. Francis Home chapel. The body then will be moved to St. Francis Convent chapel, where a wake service will take place at 7 p.m. and visitation will continue until 9 p.m.
Visitation also will be 9-11 a.m. Friday at the convent chapel, with her funeral Mass beginning at 11 a.m. Burial will follow in St. Francis Convent Cemetery. Memorials may be made to St. Francis Convent or St. Francis Home. Online condolences may be posted at www.traunerofuneralhome.com.